a nightmare for me to even get into my offense. When we did finally get the ball into our players hands safely our offense ran incredibly smooth, but the denial on the wing was forcing turnovers to pile up and allowing them easy baskets on the other end. 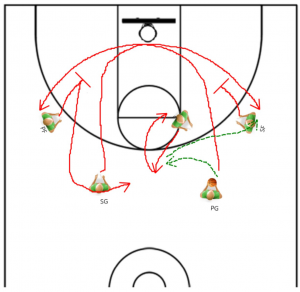 Well if you’ve ever had a problem like this, I’ve got a great play to get an easy entry into the wing, starting up one of my favourite basketball offenses – the tempo control offense. You’ll set up with your guards up top, the point on the right side, and the shooting guard on the left side, as well as both your wing players setup at the foul line extended. Your center will be standing on the right side elbow. From here your center will flash up to the three point line, taking a pass from the point guard. Now the key to this play being as effective as possible is all in the timing. As soon as the point guard gives up the ball, both guards are going to sprint straight down to the baseline, and run underneath the hoop, running a wide loop out to the wing on the opposite side of the court they were just on. 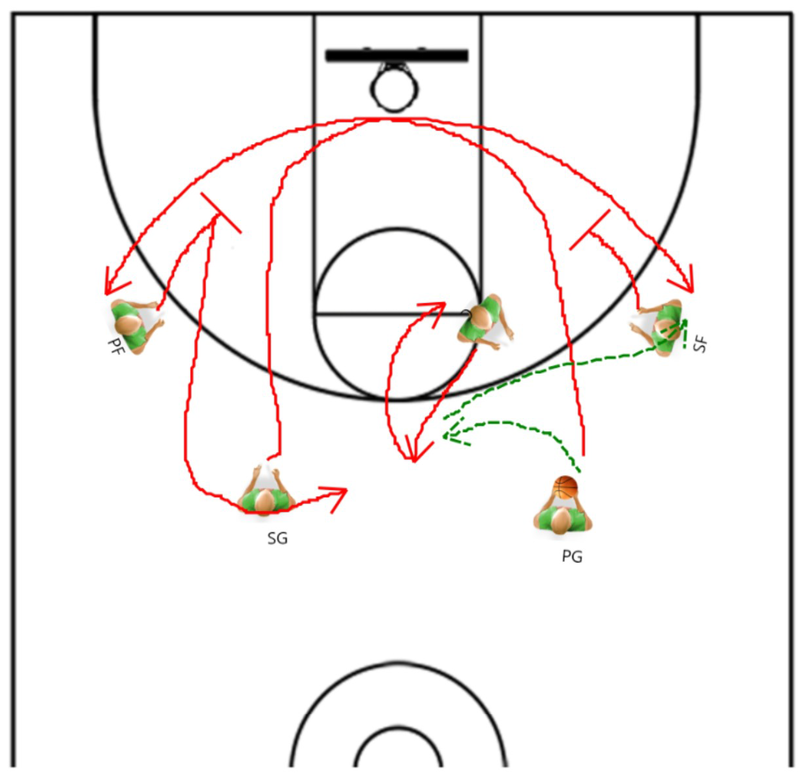 The forwards on each wing will step towards the key to set two downscreens, and the center will be free to hit whoever they feel before heading back down to the elbow area. From there, the forward on the ball side will slide down to the block, and the forward on the weak side will clash up top to the three point line, ready to play safety on defense or swing the ball through to the other wide. The key to a good offense is not necessarily the ingenuity of your play design, but rather the timing and execution – every detail down to the exact angle of the screen is what separates a wide open three point shot of that downscreen, to a closely contested one. If your looking for more plays, or want a more detailed explanation of how to come off of screens properly, just click the link. And if you’ve got any questions or comments, make sure to leave them below, or come check out our facebook page, where you can find tons of great basketball coaching tips, drills, and plays on a day to day basis! If you’re looking for more offensive ideas, make sure you check out our complete directory of basketball plays. You’ll find step by step tutorials for the most popular half court sets, as dozens of proven plays you can take right to the gym.